Bigfoot - has anybody seen one? Part II. They sure do, except they aren't taken any more seriously than other people who have had experiences. Care to back this up with evidence? "There is no special treatment for guns." ~WildCat, confirmed gun owner. A gray wolf was shot recently only a few miles from the house here. Until recently everyone thought KY had no wolves. A wild grey wolf in Kentucky? I'd like to see a legitimate reference for that. In 2010 I had several chances to plug a Sasquatch if I had wanted to. I always carry a .44 mag and usually another decent caliber backup whenever I'm in the woods. The better plan is to monitor them whenever possible and wait for nature to provide the body. They can't live forever. Someone is gonna get sick someone is gonna have an accident sooner or later. Yes, that is the better plan. Because stating the term 'sooner or later' allows one that reassuring warm fuzzy feeling inside that it's all still possible, and that's always a better plan. As any ProBigfooter worth his 'Bigfoot near-miss' could attest, any 'plan' that involves waiting indefinitely for Bigfoot is inherently a better plan than one that involves definitely finding Bigfoot. And it's obviously a whole lot easier. So how is it you had 'several chances' back in 2010 and not any since then...considering you always carry an (apparently) underpowered .44 magnum? By (almost only) your own accounts/descriptions here on the JREF, there's a Bigfoot hiding behind every tree stand down there in the wilds of your own little Kentucky Bigfoot nirvana. What happened to your 'chances' in the succeeding years if they're all still hanging around? Is the current lack of evidence enough to scientifically justify that conclusion? Pardon my speaking in absolutes, but absolutely! Asked as if your belief in Bigfoot has anything at all to do with 'science'. Of course it couldn't since mainstream science's almost total indifference towards Bigfoot has an actual basis in reality, not in one's imagination or hallucinations. The completely erroneous and wholly dishonest-to-yourself assumption you (and others) make is that mainstream science somehow has no interest in such a beast. Or even more absurdly, that science is actually sabotaging its discovery...for fear of...? And yet nothing could be further from the truth. I bet I couldn't properly describe in words the excitement science would have at any sort of actual Bigfoot evidence presented that gave even just a good indication of authenticity (i.e. to more than fringe scientists). Literally hundreds of Don "The Snake" Meldrums would be on the next train to Clarksville seeking the new Bigfoot truth. Yet nothing that profound or even close to it has ever happened. I guess the "wonder why" of that just doesn't affect you the same way it does me? And speaking to the bigger picture of ProBigfooters/ProBigfooting, there appears to be near unanimous agreement amongst such to believe in essentially every special pleading, special condition, special exception or special exemption that could possibly be uttered regarding Bigfoot's non-discovery. Such a list of 'specials' (that somebody should compile someday) would be hundreds and hundreds of items long for Bigfoot. Yet for any other subject, when that list hit five items long the subject was more than likely doomed and quickly. "Bigfoot is just too special to be like all the rest, of everything. For him to be subject to the laws of physics and nature as we know them, well all we can say is phooey on you. He's too good for that. And he's too good for you. You'll see 'sooner or later' and then you'll eat crow. Oh and we'll never acknowledge even a single instance of Bigfoot's compliance with any of such laws if it would only help further prove its non-existence. We don't ever help the enemy. Bigfoot lives! Amen brother!" I guess I forgot, Bigfoot is a WIN-LOSE proposition! They might not have any noticeable effect on wildlife populations, but if by some chance they did, we probably wouldn't know that Bigfoot is the cause. Well of course we would, just like we do with other predators. In fact, we'd run across them feeding every now and again. If they existed. But we haven't, because they don't. You mention there should be signs of eating. Nobody knows exactly what they eat. I think they're omnivores like bears, and eat whatever's available, fruit,nuts,berries, lots of vegetation as well as meat. They do leave some signs of their presence and that's one of the ways to find them. Large areas of Pine trees with missing bark are good places to frequent. I don't know why, but I know they do eat pine bark. So how do you know that? Large areas of Pine trees with missing bark are good places to frequent. I don't know why, but I know they do eat pine bark. Do you understand how ridiculous it is for you to make statements like this and back them up with photos of leaves and shadows? Do you think for a moment that bigfoots are stripping pines of their bark and the thousands of foresters in the US are not on this like white on rice? A gray wolf was shot recently only a few miles from the house here. Until recently everyone thought KY had no wolves. But as it turns out we do. Wolves must kill to survive but there doesn't seem to be any shortage of game here. Here is the wolf story which, if accurate, suggests that DNA analysis identified the Great Lakes region as the likely population of origin. This was apparently a female wolf that dispersed on her own to Kentucky, though I'd like to know more about the likelihood that she was someone's pet that either escaped or was released (more on that in a moment). Kentucky had no wolves. That's an enormous difference, and you're writing off 150 years of negative data with your apparent presumption that "wolves were there all along, but the scientists didn't believe it". "Great Lakes Region wolf biologists said the animal's dental characteristics - a large amount of plaque on its teeth - suggest it may have spent some time in captivity." Interesting how the suggestion of a large predator living under the radar for 150 years kind of crumbles when you actually do a bit of homework. Even if this wolf hadn't been in captivity, Kentucky is within the known dispersal distances for wolves from the nearest known wolf packs in Michigan. There is nothing in this story to suggest that wolves had been in Kentucky for 150 years, somehow escaping detection. They have not determined if it roamed from Michigan, or if it was an escaped wolf that originally came from Michigan. The funny thing is, I think I've actually sited a wolf in the exact same area but I quickly dismissed it as "it had to be a large coyote" because wolves weren't supposed to be here. I'm guilty of denialism to some extent. OK here's the recent story about a grey wolf killed in Kentucky. A DNA analysis performed by the U.S. Department of Agriculture's National Wildlife Research Center in Colorado determined the 73-pound animal was a federally endangered gray wolf with a genetic makeup resembling wolves native to the Great Lakes Region. The U.S. Fish and Wildlife Service Forensics Laboratory in Oregon confirmed the finding. How the wolf found its way to a Munfordville hay ridge at daybreak in March remains a mystery. Wolves have been gone from the state since the mid-1800s. Great Lakes Region wolf biologists said the animal's dental characteristics - a large amount of plaque on its teeth - suggest it may have spent some time in captivity. A largely carnivorous diet requiring the crushing of bone as they eat produces much less plaque on the teeth of wild wolves. Various evidence indicates that it was probably a captive and that DNA shows it is the same as the wolves in WI, MN, MI, Ontario, etc. No indication that this one or any other supposed grey wolf is part of a wild population in Kentucky. I guess you will go and say that the locals know they have wolves but the government denies it. Where are the bodies or other confirmatory evidence? Are the KY grey wolves like Bigfoot? I saw this on the local new recently, it's legitimate. True. Altho it may have been captive at some previous period. I've observed 1 creature eating bark from a pine tree and enjoying like it was cotton candy. I've been able to make no other eating observations regarding their diet. Everything else is speculation. I know what you're thinking, why pine bark? I dunno, it'd take a very long gut to get any nutrition from pine bark. Pine bark certainly doesn't win any award with my tastebuds (I tried it. Yuck.). Medicinal maybe? Again, I dunno? Do you have any thoughts regarding the fact that there are very few, if any other persons who have had the profound encounters you claim to have had? What makes you special in this regard? That's not denialism. It's sensible to doubt things that are unlikely. I'm sure you have proof of this, and or samples of the bark with their saliva by now right? Or is this just another unverifiable story you'd like us to believe? The premier Kentucky bigfoot site appears to be calling themselves kentuckybigfoot dot com. I understand now why the denigration of the bigfoot expeditions. Because this site sponsors them. I never did think much of the Boy Scouts, but this is proof they're not qualified in the woods. Participating in a bigfoot thing. This site has around 259 sightings in Kentucky. That's just one website. There's the BFRO, the fellow here posting, and probably others. He has sightings he reels off at convenience that aren't reported. How many people have sightings and don't report them? Telling friends or family but not contacting a site. So it is probably more like a thousand "sightings", order of magnitude, inferred from hundreds on one website alone. Put in quotes because we are not sure how much of it is lying and how much is seeing things that aren't there/power of suggestion. Jefferson county (Louisville) has seven. Total sightings from all sources is easily twice that. Pretty good for a county with 750,000 people. Just under two thousand people per square mile. This is such interesting science. Not bigfoot, but the social/psychological science of the phenomenon. No, I wasn't thinking that at all. I was thinking that if I knew where I could lay eyes on this critter on a regular basis, I'd be gathering all the info/evidence I could to put in my query to Disney, offering to sell my story for generational wealth. If you're seeing it regularly, so are other people, people as mercenary as I; if you don't cash in, they certainly will. Better get on it, for your descendant's sake. You can use part of the money to set up reserves for the creature. I realize anything I say regarding Bigfoot will sound ridiculous to you and anyone else that is denial about any large primates yet to be discovered by science. That really doesn't concern me. About the wolf in KY. One can speculate how it got here but that's only speculation. Someone's pet? Possibly. How long has it been here? I don't know. Like other creatures I only know it was here and was in the wild, not how it got here or how long it's been there. And if this was not the wolf I saw and dismissed as a large coyote, there is at least one more somewhere out there now. What is in denial here is the reality that there is not a 600lb gorilla in the room. In fact, it isn't anywhere. If you say that you saw a bigfoot once, I would consider you to be incorrect but not necessarily ridiculous. Where you wander into the ridiculous is your claim that you've seen such creatures multiple times in the same general area and that you've observed them at length and with clarity enough to make statements about their dietary preferences without a hint of physical evidence to support your claims. Bolding mine - classic! So you're employing a retroactive expectation bias and have convinced yourself that you indeed have encountered a wild wolf in Kentucky. Nothing you've written here before so beautifully illustrates how you've deluded yourself into seeing bigfoots. In other news, had you followed the information on the KY wolf to its source, you'd have seen that your "only speculation" is way off the mark. The wolf biologists who examined the animal have good reason to suggest that it was a captive animal based on their physical examination. Short of a microchip or a collar they can't prove that this was a captive wolf, but the condition of the animal's teeth strongly suggests that this is the case. To equate the informed opinion of biologists whose job it is to study wolves to your homespun "I think I saw a wolf - waitaminute - I did see a wolf!" is hubris. This is a great failing of the bigfoot faithful: someone hears a story of local knowledge trumping that of supposed experts (regardless of the veracity of such stories), and the local bumpkins assume they can universally elevate their own opinions to equal those of any expert on any issue. It doesn't work that way. I've observed 1 creature eating bark from a pine tree and enjoying like it was cotton candy. Did you see this bigfoot in all its 8' head to toe glory, or did you just observe, say the head, peeking around the side of the tree? Tell ya what. I'll hold my tongue as long as you stick to facts. I'm not special in any regard, I am just willing to do the research and get out there and look at the areas where I think they may be whereas not many others are out there doing the same. I'd like to point out the majority of my personal visual encounters happened in 2010. With no visual sightings made by myself in 2011,2012 and so far 2013. 1 other member had a good sighting in 2011 in one of the research areas. I've been absent for the late 2012 and early 2013 research seasons due to some health problems, but I'm working my way back. 12 miles or so daily trekking up and down hills is fine for a young man, but I have unfortunately started to suffer the effects of aging and poor diet. First, did I say "I did or did not" have any physical evidence to support my "claim"? No, I didn't specify. I answered a question posed to me. If you wish to inquire though, I'll say yes it is possible I do have DNA saliva samples. Regardless however, those samples will not be shared at this time. So now you may begin a chorus of "show me or you're a liar." but I won't and I'm not, so let's make a long story short please. Regarding the wolf. The wolf was shot in KY. Experts believed there were none in KY. A local boy shot one and brought it in. Looks like to me the "bumpkin" has the last laugh and the "experts" aren't as all knowing as they had believed. Now desperate to defend their reputations as "experts" , critics respond and say "Well, that was "probably" a captive wolf, a once in a lifetime deal." So that means there are no more wolves in KY now? There was only the one? The fact remains the wolf was shot in KY and it's also a fact wolves run in a pack. These "experts" are simply refusing to admit error in their prior assessment. For now, wouldn't you agree that the "bumpkin" is in the know where to find a wolf in KY much better than the "experts"? He's the one with the carcass. What's so difficult to accept about that? I'll wager not many experts spend much time in the wild looking for wolves or other creatures. Fortunately for the "bumpkin" he lives there. It seems even a body won't trump denial. And my fellow Kentuckian is completely missing the point about the grey wolf in KY. The grey wolf got whacked! Likely the only grey wolf in the state and a predator hunter shoots it. But BF never gets whacked. This is one of the iron law of opposites in bigfoot research. By your own testimony, you have not mounted an expedition (i.e. walked from car to picnic table) in years. In the meantime, Kentucky outdoorsmen of every imaginable type are crawling all over the land. So are professional wildlife managers. So it is the opposite of what is being posed: it is the bigfoot researcher who does not get out in the woods. Last edited by LashL; 31st August 2013 at 04:24 PM. Reason: Moderated thread. Chris, bear with me now, and I'll try to show you the leaps you make that separate you dramatically from how a skeptic might parse a situation. Your bias starts already. What makes you think that the "experts" are wrong? There's no reason at this point to suppose that this isn't an outlier--a lone wolf that's wandered from its territory, or a captive wolf that's escaped. You have zero facts to counter these explanations versus educated guesses based on observations made by professionals. You are spinning a tale here, injecting desperation where none is known to exist. Why would anyone be desperate to fabricate a position in this case? Do you have a theory on this? This is pure invention on your part. Yeah, there could've been only the one. You don't know any different, but you're willing to say that the people trained in this stuff are wrong. But why would they need to make wrong statements in this case? Do you think that there's some kind of conspiracy among educated people? There would have to be a conspiracy of some sort to support your claims here. You present no evidence at all that the people trained to do this stuff as their job have made any mistake at all. What can you say to convince anyone that this wasn't an outlier or escaped captive wolf? Anything? And I'm getting tired of you claiming cred for wandering around KY when I've spent years in real bush north of 60. I don't really like to talk personal stuff just as you don't, but you have not experienced the wild at all as far as I can tell. I think that the people who make their living with wildlife know more than you do, and have tramped as much in the woods as you have. You need to back off your contempt for educated people, not to mention your lack of appreciation for those who've lived and worked for years in real bush. Chris, we have one wolf that was shot in Kentucky, the first in about 150 years. Evidence from an examination of the carcass suggests that the wolf had been in captivity. That is what we know. How could this be an embarrassment for wildlife scientists? Even if the wolf was fully wild and dispersed to Kentucky on her own, so what? Have the wolf experts been making statements that wolves could never return to Kentucky? Of course not. All they can do is cite the date of the last known wolf in the state and conclude that the species was extirpated on or near that date. You seem to have taken this event as evidence that wolves have been in KY all along, and I find the logic you used to get there baffling. I certainly struck a chord with my use of the term "bumpkin". If that term offends you, then stop being one. You can start by practicing some critical thinking, and this is a great place to learn how. I missed the Fall 2012 and Spring 2013 trekking due to health issues. I still take reports from the area with the latest sighting being about a month ago. Just because I've not been there during my recovery, doesn't mean the job is vacant. Going from car to picnic table doesn't get the job done here. I could have done that in a wheelchair. Trekking is what's required. I wouldn't expect to see any signs until a minimum of 2 or 3 miles in, away from the nearest road and nearest populations of humans. From there on is where to look for activity. Fall 2013 as soon as the leaves hit the ground, I'm back in the saddle. We've now moved back over to the proper topic for the wolf discussion. I'll respond quickly then I'm back at the other thread. My point is, an expert says there are no wolves in KY. Well there are or at least there was 1. Fact. If an expert tells you there is no rattle snake in your bath water, even though one is there and you are looking at it, who knows how it got in there but will you still hop in the tub? Or will you discount the expert's opinion and pass on the bath until the snake has been removed? Going from car to picnic table doesn't get the job done here. It was what I thought to be obvious sarcasm. Describing what life is like for people who actually live and work in the woods seems futile. You seem to think you are talking to people who don't have any outdoor experience. Trekking is what's required. I wouldn't expect to see any signs until a minimum of 2 or 3 miles in, away from the nearest road and nearest populations of humans. From there on is where to look for activity. Oh really. There isn't any place in your entire county that is more than two miles from cleared land or a road. I realize the need to make it sound like you get really far from civilization, deep into the wilderness - but it is a demonstration a person doesn't know his animals to say he has to go that far to start finding sign. I still take reports from the area with the latest sighting being about a month ago. Just out curiosity, how does one collect reports of Bigfoot? I only ask because, according to Bigfooters, most sightings go unreported to authorities or to the media and most sightings do not appear on the Internet. Do you go door-to-door or something? Most of the Sasquatch related websites encourage folks to submit their encounters, just like the site our group maintains. We accept reports from all over and actively investigate them to the best of our ability. Just to be clear on the bold item above, that is a totally unsupportable statement and "footers" shouldn't make those type of definitive claims (nor should non-footers for that matter). There is no way to determine how many unreported sighting are out there. For all I know, there are none. It's possible every single sighting has been sent to one site or another. I don't think it's probable, but it's possible. The experts are talking about breeding populations, not outliers. If you ever want to use this as an argument in another thread, you'd do well to learn a little about what you're attempting to misrepresent. Mudcat, I have a hot line on the website for those outside the group as well. Since we're small and self financed we can usually only look into a three county area. I have gone to Land Between the Lakes KY and Oneida TN though. Which either is a pretty decent drive for me. I really don't like to get very far from our normal research areas though. It doesn't do much good to go look at a set of tracks if I can't get back into the same area regularly. No sarcasm intended for skeptics. It was aimed at the "Researchers" that drive to a campground and think they have Bigfoot activity all around them without stepping foot into the forest (or out of their car). We have plenty of places to look even in my home county. And yes, the creatures do not make usually themselves known in populated areas here. It takes a mile or two away from human activity to start finding sign. If they were easy to find, they wouldn't be much of a mystery. Actually, Id take a real clear picture of the snake; maybe kill it, and hand the body over to the expert, and bring along some fresh crow while I was at it..
You're just not getting it. I drove a boat a thousand miles down the Yukon River each year to commercial fish in the Bering Sea. Climbed Mt. McKinley. Trapped in the Brooks Range - 126 miles of line, three hundred traps. Flown thousands of hours over more wilderness than you can dream of in a plane that needs 100 ft to take off on a boulder field with a moose on board. When you tell me about amazing exploits in the deep wilderness of Kentucky in a county that does not have any place, anywhere, more than two miles from a road or farm field... it is just so laughable. Because there actually are places a person can go to do real expeditions, alll over the world, and you can get fifty or a hundred miles from the nearst road without all that much effort via bushplane, 4-wheeler, track rig, boat, snow machine... all of which I can see from the window I am typing from this very moment. Because they're all mine and in less than one minute from stepping out my front door I am in the wilderness - the real thing, not some make-believe B.S. I've shot a both a bear and a moose at my front door. I don't mean "from" the door, I mean the moose had his whole neck and head in my front room and the bear was trying to push the front door open so I opened it for him and greeted him with my .44 magnum. Wolves ate one of my dogs. If there actually are animals living around you then you don't have to go on an "expedition" to find them. They're eating your dog food, stealing your chickens, trampling your garden, and sometimes you shoot them dead in your underwear. You just don't get how you sound to someone who actually lives or works in the woods and has animals around them. There again. "Plenty" of places to look. Bigfoot all over the place. Except of course you have to go deep, deep into the legendary non-wilderness of your county (there is no wilderness in your county) to find them. You apparently can't see the gross contradiction of having zero acreage in your county that is two miles from "human activity", but plenty of bigfoot upon that acreage. Mathematically, it approaches infinity bigfoot per acre. By all means, show us a google earth shot of where you are talking about. Or a map. But of course, you won't. Not because you are protecting habitat, but because it doesn't exist. People who are protecting habitat like the Conservation societies in just about every state and county of the U.S. BUY land for habitat. Last edited by LashL; 6th September 2013 at 01:31 PM. Reason: Moderated thread. It takes a mile or two away from human activity to start finding sign. If they were easy to find, they wouldn't be much of a mystery. If you start finding "sign" within "a mile or two" of human activity in the United States, then that actually does sound really easy to find. 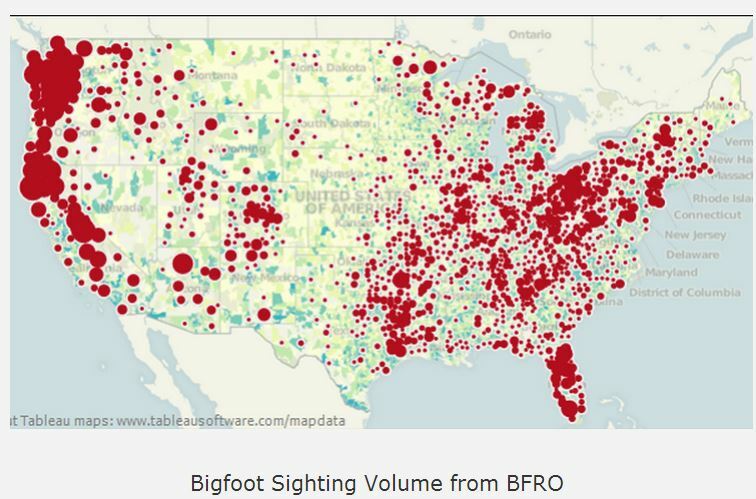 Here is a map of BF sightings as compiled by the BFRO. Somehow, they're not that difficult to find. They're only difficult to photograph or obtain some sort of physical evidence apparently. Is there a state in the lower 48 that does not have a sighting? Does anyone truly think that this map represents a real animal that somehow, over the last several hundred years, has never left any sort of proof of its existence? You have about 250 "sighting reports" on your website from Kentucky. That seems to contradict what you've said about bigfoots being hard to find, or making themselves "known" to humans.